The Theory of Continental Drift is defined as the movement of the Earth’s continents relative to each other, thereby appearing to drift together across the oceanic bed. Although Alfred Wegener was able to produce a viable hypothesis with evidence and specifically state the theory, it should be noted there were previous geologists and scientists who thought similar to Wegener. For example, between 1889 and 1909 Roberto Mantovani speculated that all continents had once been conjoined in a “supercontinent,” and even developed an expanding Earth hypothesis. 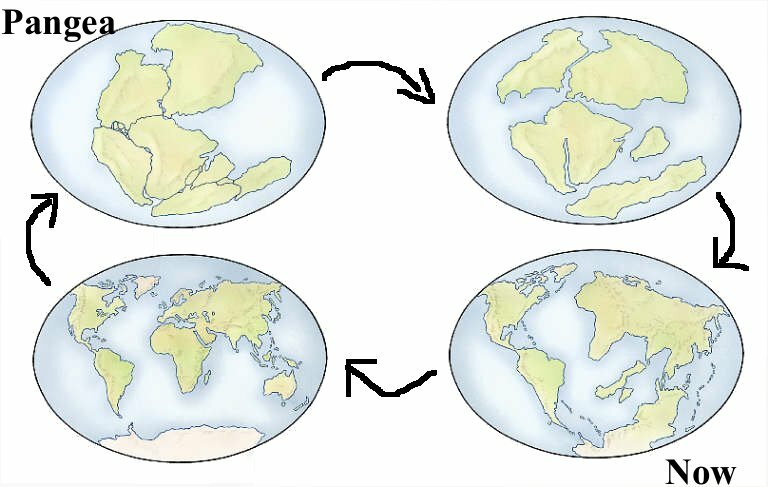 A depiction of the continents joined together as the “supercontinent,” Pangea, and the path that led them to the positions they reside in today. Alfred Wegener’s curiosity toward the possibility of continental drift came in 1910 after he noticed how Earth’s continents resembled pieces of a jigsaw puzzle. For example, he noted how South America coast correctly lined up with the coast of Northwest Africa. It wasn’t until 1911, when Wegener came across several scientific documents listing fossils of identical plants and animals found on opposite sides of the Atlantic that his passion for the subject truly showed. Reflecting on this monumental moment in his life, he wrote, “A conviction of the fundamental soundness of the idea took root in my mind.” Alfred Wegener knew massive amounts of evidence needed to be collected in order to justify such a fantastic idea—because with no practical driving force behind it the theory loses most of its credit. In order to maximize evidence for his theory and overlook the absence of a mechanism, he decided to draw from a variety of scientific fields including geology, geography, biology, and paleontology.